Did Beagle fall down this crater? Beagle 2 may have fallen down a crater on Mars recently discovered near where the lander was due to touch down, scientists on the project have said. The crater has been discovered on Isidis Planitia, a flattish basin where Beagle was targeted to land. Scientists said there was a remote possibility it landed in the crater, which may be about one kilometre wide. If this is so, there is "no way" it can communicate with Earth, but scientists stressed this scenario was "unlikely". Professor Colin Pillinger, lead scientist on the Beagle 2 project, said this was the "absolutely worst case scenario". But he added: "We'd have to be incredibly unlucky that it went right down this crater." The crater is roughly in the centre of the "landing ellipse" on Mars where Beagle was supposed to have landed on Christmas Day. 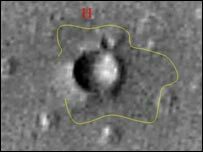 It has shown up in pictures from Mars Global Surveyor, which is in orbit around the planet. Malin Space Science Systems, which operates the camera aboard Mars Global Surveyor, identified it and sent the picture to the Beagle team late on Sunday. If Beagle did in fact disappear into this crater on its descent, it could be potentially disastrous for the mission. A rough landing on the sides of the crater - which could be as much as 700 metres deep - could have damaged the lander. A crater might also cast a shadow that would make it nearly impossible for Beagle to "power up" using its solar panels. The crater is surrounded by rocky debris, which may also have pierced Beagle's airbags or prevented it from opening its solar panels properly. However, the Beagle team stresses that this is just one of the current scenarios it is looking at. Meanwhile, UK science minister, Lord Sainsbury, who was at a Beagle news conference in North London on Monday, gave the strongest indication yet that the British Government would help fund the European Space Agency's (Esa) Aurora programme. "We need to be working with Esa to ensure that, in some form, there is a Beagle 3 that takes forward this technology. I very much hope that the Aurora programme which is currently being developed by Esa will take forward this kind of exploration." The Aurora programme is Esa's bold vision to land probes, and perhaps eventually, astronauts on the Red Planet. The ExoMars mission, set for 2009, would investigate the biology of the planet, paving the way for a more ambitious proposal to bring samples of Martian rock back to Earth for analysis. Of Beagle 2, Lord Sainsbury added: "While we're disappointed that things have not gone to plan, we're determined that the search should go on. "Both the search to make contact with Beagle 2 and also to answer the long-term question about whether there is life on Mars." All attempts to contact the lander with the Mars Odyssey craft in orbit around the Red Planet and with large radio telescopes on Earth have drawn a blank. Scientists have now set up a "tiger team" of top experts to work through all possible reasons for the silence. The group, based at the National Space Centre in Leicester, has a full-sized engineering model of Beagle and reams of technical documents and drawings to hand. It has drawn up a list of "blind" commands to send to Beagle, via the US Mars Odyssey orbiter, which might prompt it to respond. WHY MIGHT BEAGLE NOT CALL? "These commands are blind in the sense we have no idea if they are getting through - but we're going to try," said senior Beagle team scientist Professor Alan Wells. On 31 December, after the tenth attempt made to contact it, Beagle will switch over into a mode called communication search mode 1 (CSM 1). This will allow it to recognise whether it is dawn or dusk on Mars by measuring the power coming from the solar arrays. If it is still alive, Beagle will begin transmitting more regularly and will also be able to accept blind commands. "We're working under the assumption that Beagle 2 is on the surface of Mars and for some reason cannot communicate to us," said Beagle mission manager Dr Mark Sims. "The team has come up with a method of fooling the receiver into accepting commands without having to talk back to the orbiter," Dr Sims added. The Beagle 2 team has just agreed with the US space agency a plan to reconfigure its Odyssey probe to begin sending blind commands on 31 December. By 5 January, Beagle will have switched over to communication search mode 2 (CSM 2), which will allow it to communicate with its "mothership" Mars Express, which carried the "pocket watch" lander to the Red Planet. Mars Express will then be in a prime position to communicate with Beagle and scientists think this is their best hope of raising the robot. Scientists had suspected that a clock error might have meant Beagle 2 was simply transmitting at the wrong time, explaining the inability of the US orbiter and the telescopes to pick up its signals. Dr Sims said that the tiger team had now "probably" ruled out a clock error. He added that other slips of Beagle's onboard time could have been caused by a software glitch or by copying data between different parts of its memory. 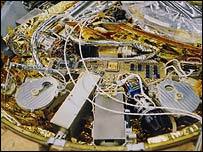 Other scenarios include a failure of the pocket watch design to open fully; a failure to deploy properly the solar "petals" that charge the Beagle battery system and obstruction of the antenna. Both the radio telescopes at Jodrell Bank in the UK and at Stanford University in the US listened out for Beagle late on Sunday - but with no positive result. One obvious explanation for silence is that Beagle was destroyed as it attempted to land on Christmas Day, but no one connected with the Esa mission is prepared yet to contemplate this awful possibility. 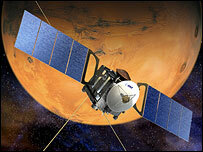 Operations to get in contact with Beagle via Mars Express will begin in earnest on 6 January. At the moment Mars Express is heading away from the planet, preparing for a major engine burn on Tuesday that will sweep it back into a polar orbit of Earth's near neighbour.